Ah marriage- I suspect that this feeling of learning more about myself and awkwardly transforming into an adult may continue until... death. Matt was away last weekend at a junior high retreat, so I was without him from Thursday to Sunday. I had exciting (kickboxing!) and noble (cleaning) plans for all the time I thought would be free with Matt not there to cuddle or entertain or listen to play music. Instead, I spent most of Thursday in traffic (still thankful for a car, don't get me wrong! ), and Friday went to youth group. Thursday night as I lay sprawled out in bed, I thought about my plans vs. reality, and I felt my brain creeping towards a sulk. But then I thought (in a way that usually means God has a hand in my thoughts) that there is more to life than cleaning and exercise, that nothing was left undone that couldn't be done later, and that the reasons I wasn't able to do EVERYTHING I wished for myself made it possible for Matt to do things he needed to do; my short thought was that wifehood was getting in the way of selfishness, and I think that's the way God made it. People who don't know me are often surprised to learn that I'm married ("how old are you!? WHY???? "), but I think it makes so much sense that having found someone to have and hold who wants to have and hold me back, we have started our life together at this point in our lives rather than waiting for our "youth"/"prime" to pass by and trying to merge whatever lifestyles and habits we created independently based on our own wants and needs. I am happy and privileged to be a wife - most of the time. Because my husband is phenomenal, the other times are usually due to growing (up) pains, when I have to set my priorities aside, or when I catch myself holding Matt to a higher standard than I keep myself. Sometimes I do have a legitimate complaint or hurt feelings because Matt's last name is not Christ and we both make mistakes. But marriage holds and shapes us together because we are doing it not only for ourselves. Side note: Sometimes it's really fun times though! We went on a random adventure to Scarborough bluffs this week and pretended to feed some birds. That is to say, some birds swam by, we pretended we were throwing bread, more birds came by, we threw some snow. 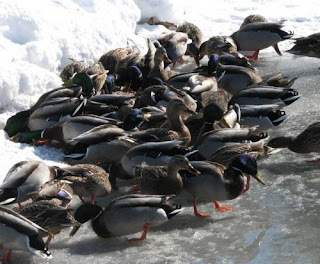 There were probably 60 ducks and 10 sawans all clambering and fighting over nothing. (It was nighttime, so I took no pictures. Thanks again, internet!!) Hopefully they did not die from expending all kinds of energy for no food. I'm sure they all felt shafted and just thought other birds kept getting the bread before them. Except the bird that got hit by a chunk of snow, he might have clued in to the situation. Matt and I were dying with laughter. Next time we'll try to take some bread, promise. PETA hates me. Good thoughts, Alyssa. After almost 25 years, marriage is still doing a number on my selfishness. And I think you're right about the learning and transforming until death, because it sure does go past 46; I see no end in sight.